Knoco stories: Is the Coca Cola recipe knowledge, or information? 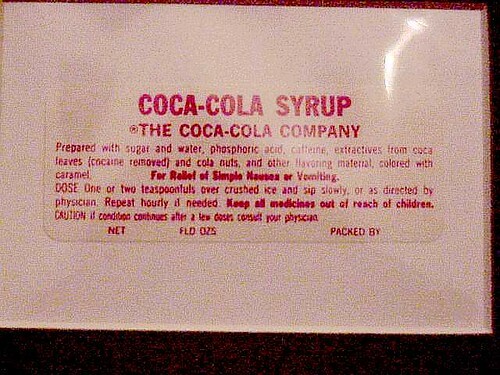 Is the Coca Cola recipe knowledge, or information? CocaColaLabel, a photo by purpleslog on Flickr. There is an interesting discussion going on in one of the Linked-In forums, started by Geert Willems, entitled "Is the Coca Cola recipe knowledge, or information?" There are, as you might expect, two fairly strongly polarised views on the topic, as this is a variation on the age-old debate "does it become information when you write it down", one of those KM arguments than never get settled..
One camp believes that if it's written, it is Information, as Knowledge resides in People, not in Documents. Another camp believes it is Knowledge, because it is Actionable, and allows someone to know how do something. My view is that this is an academic argument and not really something to worry about in a practical sense. In practical terms, any attempt to transfer the knowledge of "how to make coca cola" would require transfer of the recipe, plus of course a whole lot more knowledge, some of which could probably never be documented. The recipe is a case of being either information that helps transfer knowledge, or explicit knowledge, depending on how you want to argue it, but , whatever you call it, you need to include it in your "knowledge transfer" approach, or as part of your "knowledge asset". When I was 18, I worked in a cake factory as a Mixer, Grade 1. My task was to mix the pasty for the jam tarts - one hundredweight of flour from the four vats, 56 lb of fat from the fat nozzle, half a hundredweight of sugar and so on. Don't leave the flour scoop in the flour bin; it builds up a charge of static. If you see the flour scoop in the bin, someone else has put it there and is watching round the corner to see you get a shock. At the start of the early shift on a really cold winter morning, don't press the button for the fat, as it will have solidified in the nozzle overnight and nothing will happen, or at least not for a while. The 56 lb of fat will be delivered only later when the nozzle thaws, and will go all over the floor. You can always get something to eat at the fruit cake offcuts bin. The combination of the recipe and this additional experiential knowledge allowed me eventually to operate pretty well in the undemanding world of a Grade 1 Mixer. My suggestion is not to start with definitions of knowledge, but to start with what a person needs to know, where that knowledge comes from, and how it can be transferred. The knowledge can be transferred from person to person in many forms, and documents and recipes are one form; vital for routine operational knowledge. It could be argued that the documents themselves are information and that internalisation is required to turn the information in those documents back into knowledge, or it could be argued that the documents contain explicit knowledge per se, but the end result is the same. However, just because knowledge CAN be transferred using information, this does not mean that ALL information transfers knowledge, nor does it mean that ALL knowledge transfer involves documented information. Some knowledge comes from experience, and when it's an unpleasant experience like a static shock from a flour scoop, or 56 lb of fat all over the floor, you would rather this knowledge was transferred to you, than to have to learn it the hard way.